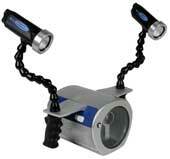 Light & Motion innovation continues with the compact Tetra housing. Tetra housings are built to accommodate Olympus' compact digital cameras including the 5 megapixel 5060 and the recently introduced 7.1 megapixel 7070. Specify camera when ordering. Light & Motion is keeping pace with the ever-changing digital video market with the release of the Bluefin HC 1000 underwater video housing. The Bluefin housing accommodates Sony's latest 3-chip compact camera the HC 1000. With Bluefin the user has access to most camcorder functions including manual focus, tele/wide, auto focus, momentary auto focus, Photo/Record mode, and light controls. Light & Motion introduces the new Mako PC350 video housing for Sony's latest Mini DV, DCRPC350. Mako is a super compact housing that is actually a Video and a Photo system in one . 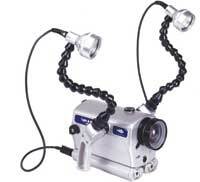 Shoot high quality video to mini dv tape and then push a button to switch to the photo mode. This means you can capture a 3 megapixel still image of any subject that seems worthy. 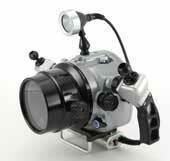 Light & Motion announces the all new ultra compact StingRay III Sport video housing . 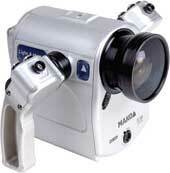 Stingray Sport is a multi-use housing that accepts a wide variety of minidv camcorders. Priced at $799, it is the perfect starter housing, and because it is multi-use you have the option of upgrading your camera. Nearly half the size of the original StingRay the new super compact StingRay III Sport offers the same design benefits including double O-ring seals, rotating latches and fingertip electronic control. 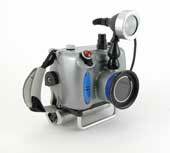 Looking for an affordable underwater video housing that performs? Look no further than Stingray. The Stingray housing line supports a wide range of Sony camcorders including the new Sony TRV50, TRV27/25/18 and TRV340/740/840 digital camcorders. 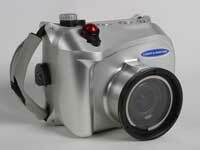 Light & Motion continues their innovation in underwater digital photography with the introduction of the Tetra 5060 Underwater Housing for the 5 mega pixel Olympus 5060 digital camera. The Olympus C-5060 was chosen “Best Buy” in its class by PC World; with 5 mega pixels and excellent storage capabilities it is a great choice for topside and underwater photography.